After making this homemade granola recipe, you’ll never want to go back to store bought! It’s packed with flavor, made with good-for-you ingredients, and SO easy to make. If you’re looking to make bars, this granola bar recipe is my favorite. 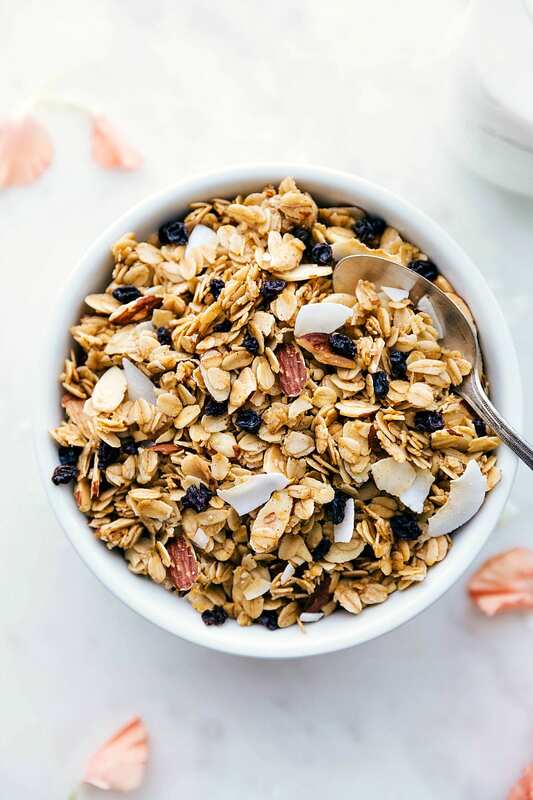 For homemade granola, this very recipe is my go-to and another favorite is this healthy granola recipe. Add a few handfuls to an acai bowl, on top of your oatmeal, or in a bowl with some milk or yogurt! One of the best traits my dad has passed down to me is a SERIOUS love for granola. It’s pretty amazing how much he consumes, and I’m not too far behind. He buys bags and bags and bags of it and transfers them to plastic cereal containers that fill up my parent’s pantry. When he came and visited us in last year in Ohio, I made sure to stock the pantry with plenty. I made several different varieties and was certain I had made too much. Turns out I didn’t make enough as it was gone by day 3! I’ve even given him batches of this recipe for birthday or Father’s Day gifts and he’s always requesting more. Since he loves it so much, I have worked and experimented to come up with the best possible version. How do you make your own granola? Start by tossing together the oats and almonds. In another bowl, you’ll mix the brown sugar, maple syrup, melted coconut oil, salt, cinnamon, and vanilla until all ingredients are well incorporated. Combine the wet and dry and then spread the mixture over 1 or 2 large baking sheets. Bake for 20-30 minutes making sure to flip and stir it everything around every 6-8 minutes. Let the mixture cool, harden, and fully set up at room temperature and then stir in your desired mix-ins! We like mixing in currants, dried cranberries or raisins and flaked coconut. Miniature chocolate chips, yogurt-covered raisins, dried chopped mango, and chocolate-covered cranberries are also frequent additions to this recipe! How bad is granola for you? So, what is better museli or granola? 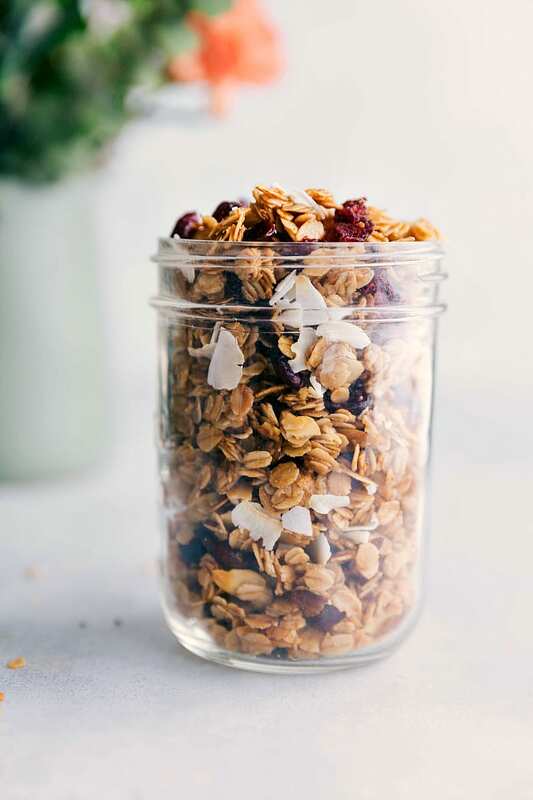 Museli and granola are both made up of grains, nuts, and dried fruits. Museli is unbaked (and generally soaked in liquid to soften it) and granola is generally tossed with oil and sweetener and then baked. 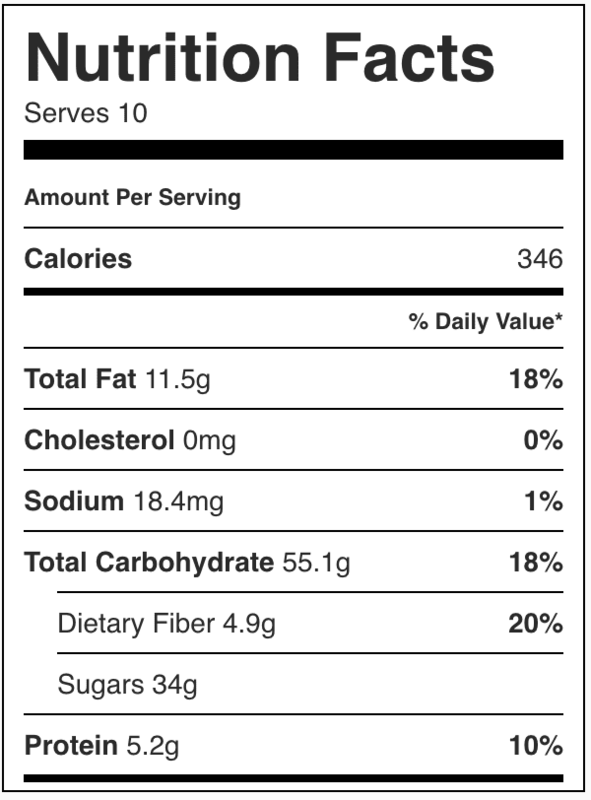 Because granola is tossed with oil and sweetener, museli is typically considered to be healthier. Can you eat granola by itself? YES! In fact by the handful is one of my favorite ways to eat it! A close second is in a yogurt bowl — yogurt for the base, tons of granola on top, fresh berries, and a few chia seeds. It’s also great on an acai bowl or smoothie bowl. How long does granola last for? It depends on your recipe. This particular recipe lasts 1 month when stored in an airtight container in a cool and dark area. If you want to freeze it, place equal amounts in sealed small freezer bags and make sure to remove any air. Freeze for up to 3 months. After making this homemade granola recipe, you'll never want to go back to store bought! It's packed with flavor, made with good-for-you ingredients, and SO easy to make. 1 cup dried cranberries, dried raisins, currants, miniature chocolate chips OR whatever similar add in you'd like! 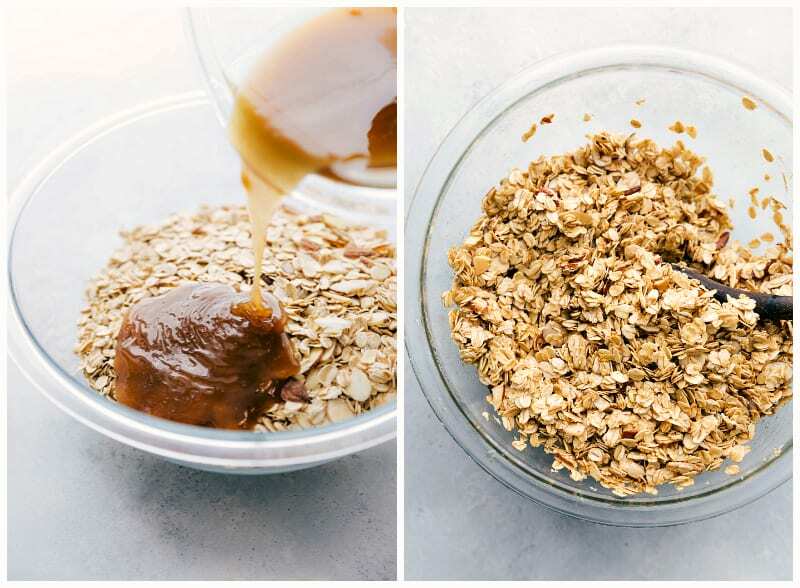 In a large bowl, toss together the oats and almonds. In another bowl, stir together the brown sugar, maple syrup, melted coconut oil, salt, cinnamon, and vanilla until all ingredients are well incorporated and smooth. Pour the wet into the dry and mix until all ingredients are well combined. Bake for 20-30 minutes (depending on the heat of your oven) making sure to flip and stir the mixture around every 6-8 minutes. Remove and allow the mixture to harden and set up. (It may be soft and not very "granola-like", but it hardens as it dries out so be careful to not over-cook it). Mine generally takes about 22 minutes and the coconut and slivered almonds are a light brown color. Once the granola is hardened, stir in the dried fruit or chocolate chips and flaked coconut. * To get toasted coconut: Stir the coconut flakes into the mixture halfway through baking. Love the big clusters! This looks amazing! I love those large clusters of granola! This looks like the perfect breakfast! This sounds yummy! I wonder can you put these chocolate covered cranberries in cookies? Mmmm…those chocolate-covered cranberries make the granola look SO irresistible!! I love the giant clusters too–they’re the best part! 🙂 Can’t wait to try! Pinned! Yum! I go on kicks where all I want is granola for breakfast! This flavor sounds wonderful! Love those clusters! That is so cute about your dad 🙂 I am obsessed with granola too and the big clusters are always my favorite! This looks perfect! I love the chocolate covered cranberries in here! This granola is amazing, Chelsea! The clusters are my favorite, I always pick out the chunks first! And I love that you used the Dove Fruits cranberries, so delicious! Love granola! This chocolate covered cranberry granola is calling my name! The bigger the clusters, the better! Looks great!! I am a freak for granola and don’t even need yogurt to eat it. I love having some in milk like I’m eating cereal! Can’t wait to try this recipe and get some clusters up in here! You and your dad sound just like me! I had to stop baking granola because it was ALL I would eat for breakfast, lunch, snacks, and dessert. Just like him, it’d disappear in a few days — tops! Pinned! For me, granola is ALL about the big clusters 😉 I would always be picking them out and eating them first as a kid! 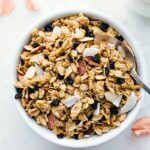 Love the looks of this granola, and you can’t go wrong with a little chocolate in there either!